Recently, NASA revealed a shocking truth to mainstream culture: much of the world is on fire, and you probably had no idea! NASA released an image on August 23rd that shows which places are on fire at the moment and it is shockingly full of red zones. 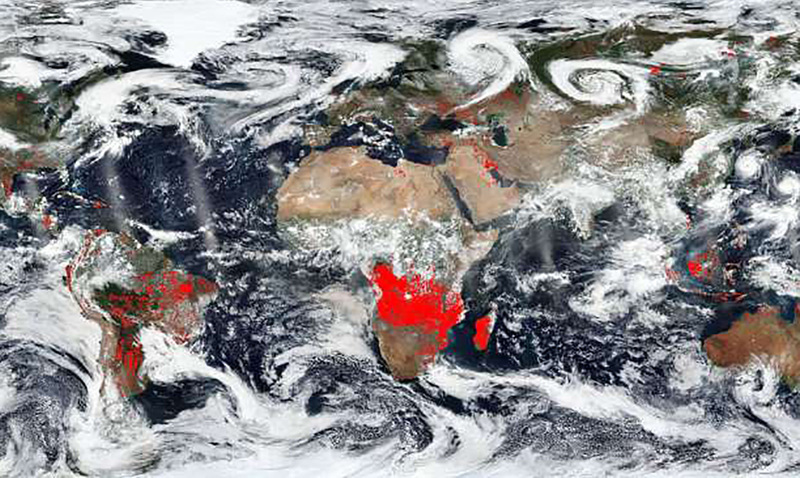 The NASA worldview image shows just how prominent fires are at the moment and it is quite alarming. As you can see, the red points are areas in which actively burning fires have been detected. However, in Brazil, the fires are both wildfires and man-made fires set to clear crop fields of detritus from the last growing season. Fires are also commonly used during Brazil’s dry period to deforest land and clear it for raising cattle or other agricultural or extraction purposes. The problem with these fires is that they grow out of control quickly due to climate issues. Hot, dry conditions coupled with wind drive fires far from their original intended burn area. According to the Global Fire Watch site (between 8/15 and 8/22) shows 30,964 fire alerts. NASA’s Earth Observing System Data and Information System (EOSDIS) Worldview application provides the capability to interactively browse over 700 global, full-resolution satellite imagery layers and then download the underlying data. Many of the available imagery layers are updated within three hours of observation, essentially showing the entire Earth as it looks “right now. This satellite image was collected on August 22, 2018. Actively burning fires, detected by thermal bands, are shown as red points. In just two years time wildfires in Chile have managed to burn over 1 million acres. We really need to better understand these fires so that in the future we can get them under control. While a recent study suggests Chile should try to move away from exotic plantations as a means of better preventing these fires other places in the world have yet to figure out their nest moves. Fires of all kinds are a real problem in the world today. Fire is something that spreads much quicker than you could ever imagine.